A facile strategy was developed here to prepare cross-linked polymeric nanocapsules (CP nanocapsules) with silica nanoparticles as templates. The silica nanoparticle@cross-linked polymer nanoparticles were prepared by the encapsulation of the silica nanoparticles by the one-pot approach via surface-initiated atom transfer radical polymerization of hydroxyethyl acrylate in the presence ofN,N′-methylenebisacrylamide as a cross-linker from the initiator-modified silica nanoparticles. After the silica nanoparticle templates were etched with hydrofluoric acid, the CP nanocapsules with particle size of about 100 nm were obtained. The strategy developed was confirmed with Fourier transform infrared, thermogravimetric analysis and transmission electron microscopy. Polymer nanocapsules, the nanometer-sized hollow polymer spheres, have attracted more and more researching interests because of their fascinating potential applications such as drug delivery [1, 2], microreactors [3, 4], imaging , catalysts , and self-healing materials . By now, many excellent strategies had been developed for the preparation of polymer nanocapsules [8–10]. In order to assert the control over the shell thickness of polymeric nanocapsules, the approach based on the surface-initiated controlled/“living” radical polymerization (CLRP) has been developed with nanoparticles as templates [11–15]. In the approach, the polymer brushes were grafted from the nanoparticle templates via the surface-initiated CLRP technique, and their functional side-groups were cross-linked to obtain the cross-linked polymeric shells. Then the structure-stable micro or nanocapsules were achieved after the etching of the templates encapsulated in the cross-linked polymeric shells. In the present work, we developed a simple strategy for the preparation of the cross-linked polymeric nanocapsules (Scheme 1). The cross-linked polymeric shell was coated on the silica nanoparticle templates via the surface-initiated atom transfer radical polymerization (SI-ATRP) of hydroxyethyl acrylate (HEA) in the presence ofN,N′-methylenebisacrylamide (MBA) as a cross-linker using a one-pot method. So the cross-linking process of the polymer brushes was not needed. Silica nanoparticles with average particle size of 10 nm were MN1P obtained from Zhoushan Mingri Nano-materials Co. Ltd, Zhejiang, China. They were dried in vacuum at 110 °C for 48 h before use. γ-Aminopropyltriethoxysilane (APTES) (Gaizhou Chemical Industrial Co. Ltd, Liaoning, China) was used as received. Bromoacetylbromide was of analytical reagent grade and purchased from Acros Organics (Phillipsburg, New Jersey, USA). Cu(I)Br (Tianjin Chemical Co., Tianjin, China) was of analytical reagent grade and purified by being stirred in glacial acetic acid, filtered, washed with ethanol and dried. 2,2′-Bipyridine (bpy) (A.R., 97.0%), provided by Tianjin Chemical Co., China, was recrystallized twice from acetone. HEA was of analytical reagent grade from Beijing Eastern Yakeli Chemical Engineerings S & T Ltd Co., Beijing, China. Other reagents and solvents used were all of analytical reagent grade and obtained from Tianjin Chemical Co., Tianjin, China, and were used without further purification. Distilled water was used throughout. The initiator-modified silica nanoparticles, bromoacetyl-modified silica nanoparticles (BrA-SN), were prepared with the same procedures as reported previously . The one-pot SI-ATRP of the monomer and cross-linker from the initiator-modified silica nanoparticles was conducted as follows : the initiator-modified silica nanoparticles (SiO x –Br, 0.50 g, 0.25 mmol), 2, 2′-bipyridine (bpy, 1.964 g, 12.576 mmol), and 50 mL water were combined into a 100-mL round-bottom flask. After the solution became homogeneous, the monomer, HEA (15.7 mL, 150 mmol), and the cross-linker, MBA (2.313 g, 15 mmol), were added. The flask was sealed and deoxygenated by three freeze–pump–thaw cycles. During the final cycle, the flask was filled with nitrogen, and 0.902 g (6.288 mmol) of CuBr was added to the frozen mixture. The flask was sealed with a glass stopper, then evacuated and back-filled with nitrogen four times before it was immersed in a thermostated oil bath at 70 °C. The polymerization was stopped at 72 h by opening the flask and exposing the catalyst to air. The nanoparticles were washed thoroughly with water and ethanol in turn and then dried in vacuum. Part of the silica nanoparticles@cross-linked polymer (SN@CP) nanoparticles was dispersed in aqueous solution of hydrofluoric acid for 48 h to etch the silica nanoparticles templates. The cross-linked polymeric nanocapsules were separated by being centrifugated, washed with ethanol, and dried in vacuum. Bruker IFS 66 v/s infrared spectrometer was used for the Fourier transform–infrared (FT–IR) spectroscopy analysis in the range of 400–4,000 cm−1with the resolution of 4 cm−1. The KBr pellet technique was adopted to prepare the sample for recording the IR spectra. Thermogravimetric analysis (TGA) was performed with a Perkin–Elmer TGA-7 system at a scan rate of 20 °C min−1to 800 °C in N2atmosphere. The morphologies of the SN@CP particles and the CP nanocapsules were characterized by a JEM-1200 EX/S transmission electron microscope (TEM). The nanocapsules were dispersed in water or dimethylformamide (DMF) in an ultrasonic bath for 5 min and then deposited on a copper grid covered with a perforated carbon film. The reaction scheme to the cross-linked polymeric nanocapsules from the silica nanoparticles@cross-linked polymer composite particles via the one-pot SI-ATRP technique is illustrated in Scheme 1. In the first step, the terminal –OH groups on the surface of silica nanoparticles were converted to –NH2 groups by the self-assembly of γ-aminopropyltriethoxysilane on the surface of the silica nanoparticles. Then the –NH2 groups were bromoacetylated with bromoacetylbromide. The carbon and nitrogen elemental analysis indicated that about 0.5 mmol initiating group per one gram of SiO x –Br nanoparticles were immobilized . After the one-pot radical copolymerization of monomer HEA and cross-linker MBA via SI-ATRP technique, the characteristic absorbances of the ester carbonyl and amide carbonyl groups at 1,735 and 1,654 cm−1respectively, and –OH stretching peak at 3,441 cm−1emerged in the FT–IR spectrum of the SN@CP particles (Fig. 1). It indicated that the monomer HEA and cross-linker MBA had copolymerized from the initiator-modified silica nanoparticles to form the cross-linked polymer shell. The TGA curve of the SN@CP particles is shown in Fig. 2. The cross-linked polymer shells were found to be decomposed at the temperature higher than 350 °C. The weight loss before the decomposition was attributed to the release of the moisture adsorbed because the (co)polymers of HEA and/or MBA have good water absorption. Thus, the total percentage of grafting (mass ratio of the polymer grafted and the silica template) was calculated to be about 12% with a polymerizing time of 72 h. It seemed that the polymerizing rate in this work was lower than that of the works reported [17, 18]. It might be due to the gelation of the polymerization and the poor solubility of the polymer shells in water . 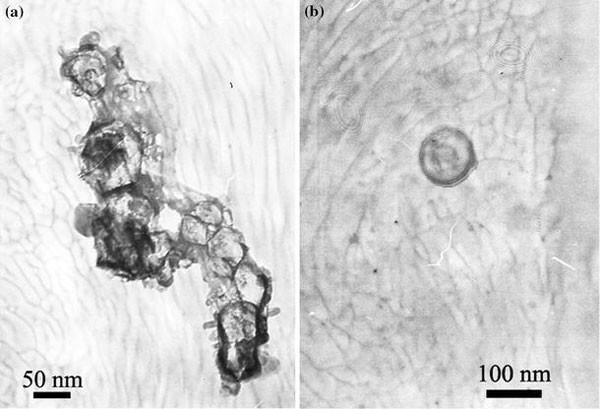 Then the silica nanoparticle templates encapsulated with the cross-linked polymer shells were removed by being etched with hydrofluoric acid for 48 h. The products were also characterized with FT–IR, TGA, and TEM. In the FT–IR spectrum of the CP nanocapsules (Fig. 1), the peak at 1,099 cm−1and a middle peak at 804 cm−1corresponding to the symmetrical and asymmetrical stretching vibration of Si–O–Si and the bend-vibration absorption band of Si–O at 467 cm−1, which presented in the FT–IR spectrum of the SN@CP particles, disappeared. It indicated that the silica templates had been removed completely by being etching with hydrofluoric acid for 48 h. The TGA curve of the CP nanocapsules (Fig. 2) also testified the viewpoint because the sample had been decomposed absolutely before 650 °C. The TEM images of the CP nanocapsules are given in Fig. 3. For the sample dispersed in water (Fig. 3a), the obvious aggregation of the nanocapsules was found. 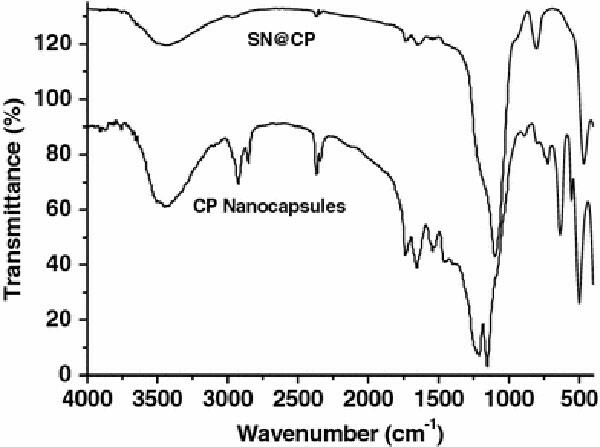 As for the sample dispersed in DMF, the single CP nanocapsules were obtained (Fig. 3b). It also indicated that the cross-linked polymer shells showed poor affinity with water. 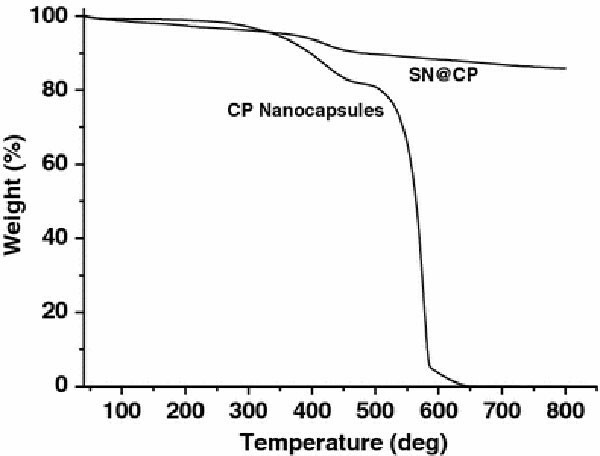 The diameter (about 100 nm) of the CP nanocapsules was found to be much bigger than that of the silica nanoparticle templates with an average diameter of 10 nm. It was due to the aggregation of the silica nanoparticles in the storage period and also the surface modification and cross-linking polymerization processes, as reported previously [14, 15, 17]. The aggregations in these works could be broken partly with ultrasonic irradiation because the polymer brushes grafted were not crosslinked. Contrarily, the cross-linked polymer shells were obtained in the present one-pot method. The interparticle aggregations here could not be broken, so the cross-linked polymer shells with the bigger size remained as the cross-linked polymeric nanocapsules after the etching of the silica nanoparticle templates. In summary, cross-linked polymeric nanocapsules with particle diameter of 100 nm were successfully prepared via template approach with the one-pot surface-initiated atom transfer radical cross-linking polymerization technique. So the cross-linking reaction of the polymer brushes grafted onto the templates could be ignored. Furthermore, the synthetic method developed here is a generalized method, which can be extended to the other cross-linked polymeric nanocapsules. It is also expected that the cross-linking degree of the polymeric shells could be controlled by the polymerizing condition such as the molecular ratio of the monomer and cross-linker. This project was granted financial support from China Postdoctoral Science Foundation (Grant No. 20070420756) and supported by the National Science Foundation for Fostering Talents in Basic Research of the National Natural Science Foundation of China (Grant No. J0730425).